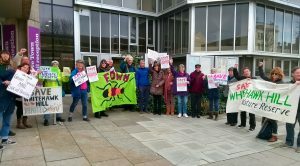 Campaigners were celebrating after plans to build low-cost homes for hundreds of poorer working families in Brighton were formally halted today (Monday 18 March). The protesters, from Save Whitehawk Hill Local Nature Reserve, said that the proposed new homes “should not be at the expense of nature and the communities that enjoy the hill”. They had been fighting plans to build more than 200 flats close to several other blocks at the top end of Whitehawk. The plans were drawn up by Homes for Brighton and Hove – a joint venture between the Hyde housing association and Brighton and Hove City Council. The decision was made at a board meeting at Hove Town Hall today after the campaigners staged a demonstration outside this morning. The campaign group said that despite the reprieve, the nature reserve had not been save yet. It said: “Local residents are jubilant that at a board meeting today Homes for Brighton and Hove, a joint venture partnership between Brighton and Hove City Council and Hyde Housing, has decided to drop proposals to build five high-rise housing blocks in the middle of Whitehawk Hill Local Nature Reserve. “The proposals would have cut the reserve in half, damaging its integrity and threatening its wildlife, as well as severing views along the hill and interrupting access to and from the Downs. “While fully supporting the demand for social housing and preferably council housing in the city, Save Whitehawk Hill Local Nature Reserve argued this should not be at the expense of nature and the communities that enjoy the hill and that other ways of delivering these homes should be sought such as on the Brighton General Hospital site. 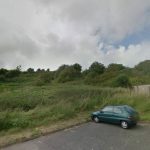 “However, the battle isn’t over as Whitehawk Hill is currently on a list of housing allocations in the City Plan Part 2, which means that there could be another development on the nature reserve in the future. Ecologist Richard Bickers said ‘The next stage in the campaign is to fight to get Whitehawk Hill removed from the list of allocations in (the draft) City Plan Part 2. The council said: “Proposals from the Homes for Brighton and Hove partnership to develop more than 200 new affordable homes on a site in the north of Whitehawk are to be stopped. “The decision was taken at a Homes for Brighton and Hove board meeting on Monday 18 March following a report identifying that the development of affordable housing would not be financially viable due to a number of access and technical difficulties on the site. “Homes for Brighton and Hove is a partnership between Brighton and Hove City Council and the Hyde Group, aiming to build 1,000 new much-needed affordable homes for rent and sale in the city for lower-income local working households. 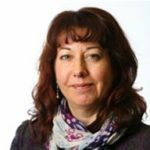 “The Homes for Brighton and Hove board is made up of three councillors from the main parties on the council’s Housing and New Homes Committee and three representatives from Hyde. “The Whitehawk site had been identified for housing development in the draft City Plan Part 2, following the requirement to look for sites for 1,000 new homes on the city’s urban fringe to help meet the urgent need for housing established in the City Plan Part 1. “Feedback from the public consultation and some local opposition expressing concerns about the environmental impact of the proposals were noted by the partners. “Landscape and ecology studies have shown that, with certain ecological mitigations in place, housing could be developed on the site without significant adverse impacts on the local nature reserve. Council leader Daniel Yates signalled the demise of the scheme at a meeting of the council’s Policy, Resources and Growth Committee at Hove Town Hall on Thursday 24 January. Councillor Yates said: “A number of complexities have come up with the Whitehawk Hill urban fringe site, including technical issues that impact on the financial viability of the proposed development. 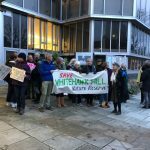 “In view of these issues it is my intention to ask the Homes for Brighton and Hove board to consider removing the development of the Whitehawk Hill site from its proposals.